If you're a baseball fan and were hoping for a post on the Cards, sorry! I've been a bit obsessed with cardinals (the birds) lately. Either in the Spring or early Summer, a friend of mine posted on Facebook that seeing a cardinal is a sign that someone who has passed away is coming to visit. 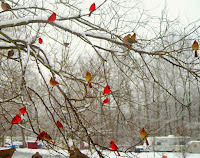 The morning that Mama passed away, there were several cardinals at the bird feeder. The morning that I read the post from Michele, a female landed on the shephard's crook near to where I sat and chirped loudly, almost like she was scolding me. That morning I was extremely sad, until I saw the bird. I've seen a female cardinal every day since the funeral, usually in the mornings when I'm having the hardest time with her being gone. Sunday morning, CH & I were talking about Mama when he looked outside and told me there was a cardinal at the bird feeder at the edge of the porch. Seeing them is a comfort. Maybe I'm grasping at straws, but I'm loving seeing and hearing those birds. The call of a cardinal can come to cheer us up, or cheer us on. The unique clarity of his call is can be used to gain our attention and lift us from our depression, our sorrow or perhaps our ordinariness. The cardinal’s call can call to us to do our duty. A cardinal call can tell us to give up any vanity or appearances we may be holding on to and follow the hope in our heart, a cardinal hope that will lead us, on our upward journey through the cycle of life. A cardinal is a representative of a loved one who has passed. When you see one, it means they are visiting you. They usually show up when you most need them or miss them. They also make an appearance during times of celebration as well as despair to let you know they will always be with you. Look for them, they'll appear. Well, I was rather hoping to read something about the baseball team. ;-) But truth be told, I was glad to read that you're finding comfort for your hurting heart. Oh, I just love that, Mary! My mom loved hummingbirds and whenever I see one, which is frequently lately, I think it's her way of letting me know that she's A-OK. I think there are those connections with loved ones that God lets us find peace in & still lets connections happen. Love that! "Rare Bird: A Memoir of Loss and Love"
You know, I'm sure the cardinals are God's special messengers, telling you that all is well. Embrace it and enjoy her visits. She knows you know. I believe. How beautiful. You & I can take comfort, when we see a cardinal, that our loved ones are A-Ok. I love that the cardinals are bringing you comfort! I do think that sometimes things like that are one of those little things to let us know that our loved ones are still looking out for us all the time.